David Hockney (b. 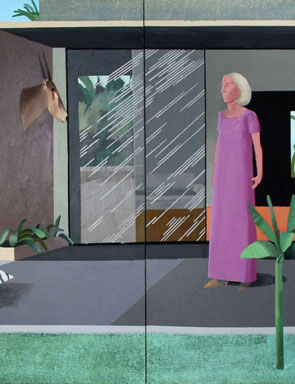 1937), Beverly Hills Housewife, diptych--acrylic on canvas overall: 72 x 144 in. (183 x 366 cm.). Price realised : $7,922,500. New world auction record for the artist. Photo: Christie's Images Ltd. 2009. NEW YORK, NY.- In a packed salesroom, bidders drove Christie's Post War & Contemporary Art Evening Sale total to $93,734,500, led by strong results for the Betty Freeman Collection and five new world auction records for artists David Hockney, Claes Oldenburg, Douglas Wheeler, Tony Smith, and Kerry James Marshall. The sale was 91% sold by lot and 94% by value. “Tonight’s strong sell-through rates signaled a clear and resounding vote of confidence in the market from a deep pool of collectors around the world, vying for almost every lot in the sale. With 30 lots selling for over the $1 million mark and five new world auction records, the results show there is continued readiness to compete for rare and high-quality works, especially those from estates, museums and private collections,” said Marc Porter, President Christie’s Americas. 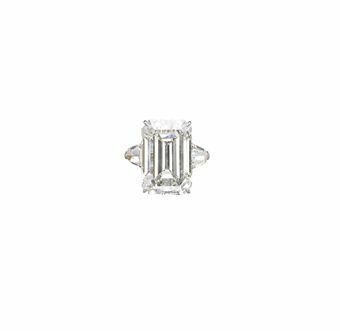 Leading the Evening Sale was a group of 20 works from the collection of the renowned American philanthropist Betty Freeman which was 90% sold by lot and achieved a combined total of $31,606,500. 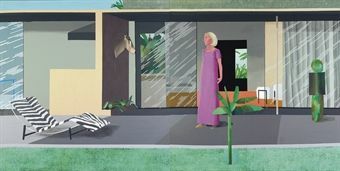 One of the most important David Hockney works to come to the auction market, Beverly Hills Housewife, 1966-1967, achieved the evening’s top price of $7,922,500, and set a new world auction record for the artist. 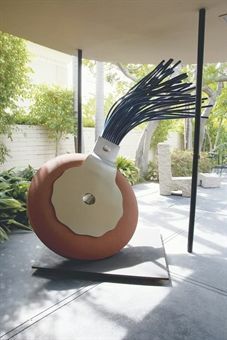 Typewriter Eraser, a work that epitomizes Claes Oldenburg's revolutionary approach to sculpture sold for $2,210,500 and set the second auction record of the night. The catalogue cover lot, Roy Lichtenstein’s Frolic, 1977, fetched $6,018,500, followed by a rare, early painting by Sam Francis from 1954 entitled Grey, which achieved $3,666,500. 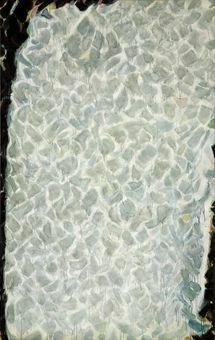 First exhibited in Dorothy Miller’s seminal 1954 MoMA show, Twelve Americans, the painting was acquired directly from Francis’s private collection by Mrs. Freeman, who enjoyed a long and close relationship with the artist. Douglas Wheeler’s Untitled, 1968 set a new world auction record for the artist, selling for $290,500. 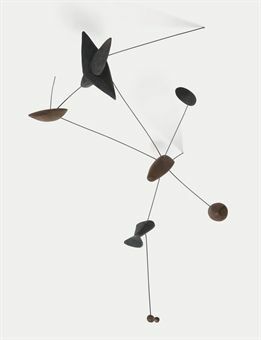 Rounding out the Freeman collection was Alexander Calder’s Gypsophila on Black Skirt, 1950, a coveted work that witnessed strong bidding, sold for $1,986,500. Claes Oldenburg (b. 1929), Typewriter Eraser, painted aluminum, stainless steel, ferroconcrete and bronze, 89½ x 80 x 70 in. (227.3 x 203.2 x 177.8 cm.) Executed in 1976. This work is number three from an edition of three. 1/3, Virginia Museum of Fine Arts; 2/3, Nasher Collection. Price realised :$2,210,500. Second auction record of the night. Photo: Christie's Images Ltd. 2009. 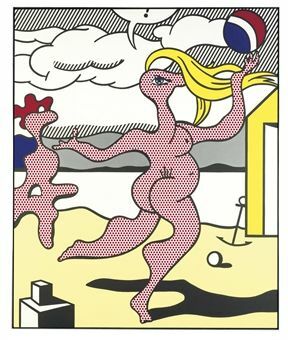 Roy Lichtenstein (1923-1997), Frolic, oil and magna on canvas, 80 1/8 x 66 1/8 in. (203.5 x 168 cm.) Painted in 1977. Price realised : $6,018,500 . Photo: Christie's Images Ltd. 2009. Sam Francis (1923-1994), Grey, oil on canvas, 119 x 75¾ in. (302.3 x 192.4 cm.) Painted in 1954. Price realised : $3,666,500. Photo: Christie's Images Ltd. 2009. 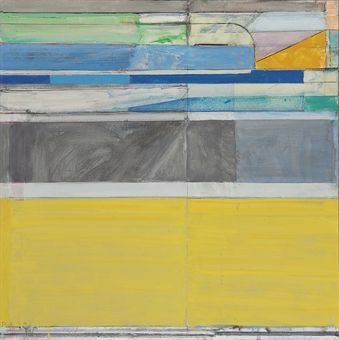 Richard Diebenkorn’s Ocean Park No. 117, 1979, a consummate work for the artist, which luminously illustrates the best qualities of his most celebrated series of paintings, achieved $6,578,500, just shy of the artist’s auction record of $6.76 million. Through his use of bright and cool blues and yellows, the artist communicates the ephemeral quality of nature, capturing the sensation and radiance of the coastal environment in which this work was created. Richard Diebenkorn (1922-1993), Ocean Park No. 117, oil, graphite and charcoal on canvas, 45 x 45 in. (114.3 x 114.3 cm. ), Painted in 1979. Price realised : $6,578,500. Photo: Christie's Images Ltd. 2009. Masterfully executed, Jean-Michel Basquiat’s totemic Mater, 1982, an electrifying, rare rendition of a female figure was acquired for $5,850,500. 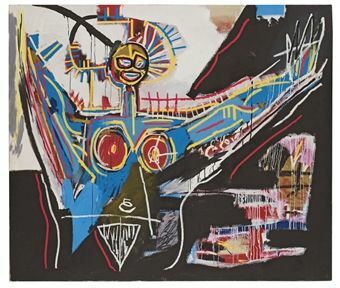 Painted during what many would describe as the apex of Basquiat’s tragically short yet undeniably brilliant career, this work exudes the energy of a young artist at the pinnacle of his creative output. Jean-Michel Basquiat (1960-1988), Mater, acrylic and oilstick on canvas, 72 x 84 in. (182.8 x 213.3 cm.) Painted in 1982. Price realised : $5,850,500 . Photo: Christie's Images Ltd. 2009. 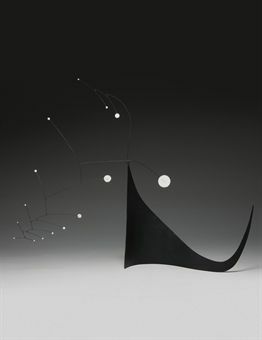 The auction yielded particularly strong results for the other works by Alexander Calder in the sale, including a rare wall relief, Untitled, 1943 which realized $2,826,500 and the poetic and hypnotic Seven Black on Black, 1956 from the private collection of prominent New York philanthropist and arts patron, the late Caral Gimbel Lebworth, which totaled $1,142,500. A second Post-War highlight from that collection, Jean Dubuffet’s Corps de dame, rose incarnate, executed in 1950 achieved $1,762,500. Alexander Calder (1898-1976), Untitled, wall relief--painted and unpainted wood and wire Executed circa 1943. Price realised : $2,826,500. Photo: Christie's Images Ltd. 2009. Highlights by Abstract Expressionist masters performed well, including an early, classic drip drawing by Jackson Pollock, Untitled, 1951, which fetched $506,500, a dynamic and powerful Woman by Willem de Kooning from 1953, which achieved $3,666,500, and a vibrant and refreshing work by Hans Hofmann, Wild Vine, 1961 that totaled $1,202,500. 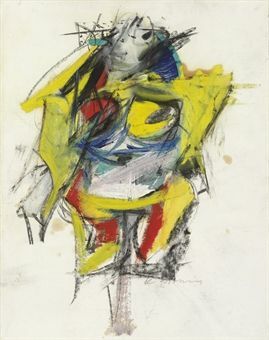 Willem de Kooning (1904-1997), Woman, oil, charcoal, wax crayon and graphite on paper laid down on canvas, 24 x 18¾ in. (61 x 47.6 cm.) Executed in 1953. Price realised : $3,666,500. Photo: Christie's Images Ltd. 2009. Achrome, 1958-59 by Piero Manzoni sold for $2,602,500. Considered the enfant terrible of Italian Post-War Art, Manzoni dedicated his illustrious but short-lived career to creating conceptual works that unwaveringly rejected artistic tradition. 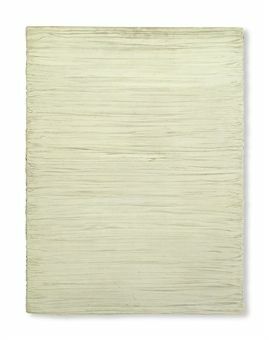 Piero Manzoni (1922-1963), Achrome, kaolin on canvas, 39½ x 29½ in. (100 x 75 cm.) Painted in 1958-1959. 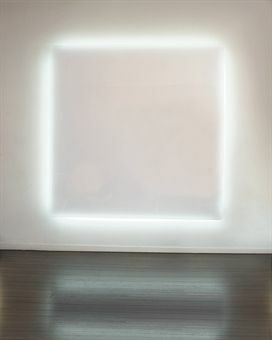 Price realised : $2,602,500 Photo: Christie's Images Ltd. 2009. Contemporary artists featured in the sale also achieved strong results and records. 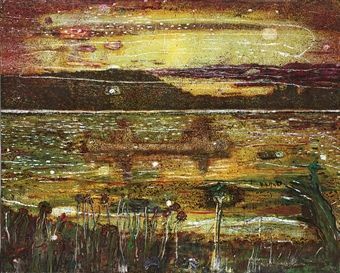 Peter Doig’s Night Fishing, 1993, realized $4,674,500. This large-scale painting is an evocative, quintessential example of Doig’s most celebrated theme: the canoe in water. Peter Doig (b. 1959), Night Fishing, oil on canvas, 79 x 98¼ in. (200.7 x 249.6 cm.) Painted in 1993. Price realised : $4,674,500. Photo: Christie's Images Ltd. 2009. Jeff Koon’s gleaming, Duchampian Jim Beam – J. B. Turner Engine, 1986, achieved $2,322,500 after a spirited round of bidding. Koons drew inspiration for the sculpture from a commemorative collector’s bottle in the form of a locomotive issued by the Jim Beam company. This sculpture marks the first time Koons worked with stainless steel, a material he would champion and take to new heights later in his career. Jeff Koons (b. 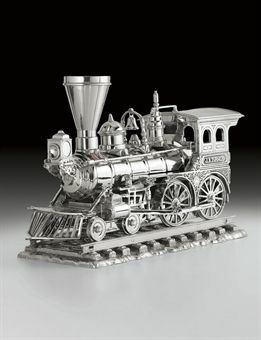 1955), Jim Beam - J.B. Turner Engine, stainless steel and bourbon, 17¼ x 6¾ x 11 in. (43.8 x 17.1 x 27.9 cm.) Executed in 1986. This work is the artist's proof from an edition of three plus one artist's proof. Price realised : $2,322,500. Photo: Christie's Images Ltd. 2009. 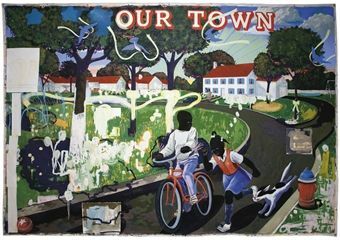 Debuting in the Evening Sale, Kerry James Marshall’s definitive work, Our Town, 1995, achieved $782,500, setting a new world auction record for the artist. The work is equal parts familiar and surreal, presenting an idyllic narrative of life that is disrupted by the artist’s painterly devices, and draws attention to the artifice put forth by the global perception of American life. Kerry James Marshall (b. 1955), Our Town, acrylic and printed paper collage on canvas, 100 x 142 in. (254 x 360.7 cm.) Painted in 1995. Price realised : $782,500. Photo: Christie's Images Ltd. 2009. In the fifth auction record of the evening, Tony Smith’s sleek, geometrical form, Duck, (conceived in 1962-63/executed in 1995) achieved $842,500, surpassing its pre-sale high estimate of $800,000. 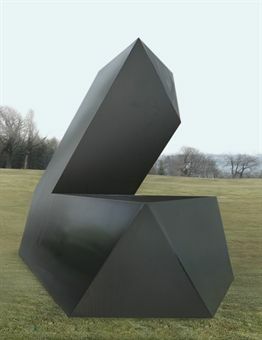 Tony Smith (1912-1980), Duck, painted steel, 136 x 166 x 111 in. (345.4 x 421.6 x 281.9 cm.) Conceived in 1962-1963, executed in 1995. The work is number two from an edition of three plus one artist's proof. Price realised : $842,500. Photo: Christie's Images Ltd. 2009. Douglas Wheeler (b. 1939), Untitled, vacuum-formed transluscent Plexiglas, and neon tubing, 80 x 80 in. (203.2 x 203.2 cm.) Executed in 1968. Price realised : $290,500. Photo: Christie's Images Ltd. 2009. Alexander Calder (1898-1976), Gypsophila on Black Skirt, standing mobile--painted sheet metal and wire, 31 x 37 x 9 in. (78.7 x 94 x 22.9 cm.) Executed in 1950. Price realised : $1,986,500. Photo: Christie's Images Ltd. 2009.